Home > Light Duty V Belts > Gates Powerated V Belts. 3/8" thru 5/8" Widths. > 6826 PoweRated V-Belt. 4L Section. Kevlar > A24 Belt. Classic A-24 V-Belt. Replaces 4L260 FHP V-Belts. > AX24 Molded Notch V-Belts: AX Series > 4L260 FHP V-Belt > 4L260K Kevlar FHP V-Belt. Consumer Brand. 4L260K FHP V-Belt. Aramid/Kevlar Consumer Brand. 1/2” W x 26" Overall Length. GATEST 4LXP655 (obsolete) Lawn and Garden Belt. 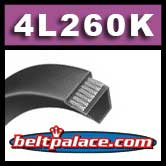 Classical A24K/A24KC V-Belt on light duty applications.